This year, East Jakarta Forestry Sub-dept. is about to repair the green belt's fence of the Kiwi junction to Ciracas GOR, Jalan Raya Bogor. Currently, they are preparing the auction for the repair work.
" We will auction first, and its installation will be done in the third quarter of 2012. To execute it, we will spend around Rp 900 million"
East Jakarta Forestry Sub-dept. 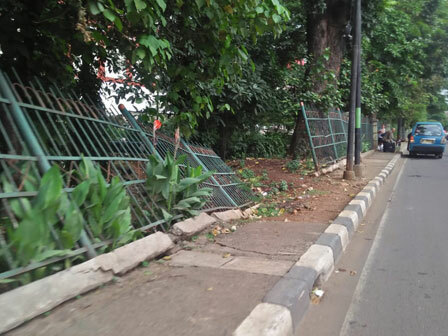 Head, Romi Sidharta disclosed, the length of fence repaired is about 450 meters. It is conducted, as many iron fences are damaged and missing. "We will repair the fence, starting from Kiwi junction to the front of Ciracas GOR. Its length is about 450 meters," he stated, Thursday (3/29). He assessed, the fence that will be installed is adjusted to the existing condition. It has a height of about 220 centimeters and uses a screw iron in the size of about 18 millimeters. To make it sturdy, pillars will be installed at a distance of about 10 meters. "We will auction first, and its installation will be done in the third quarter of 2012. To execute it, we will spend around Rp 900 million," he stated.